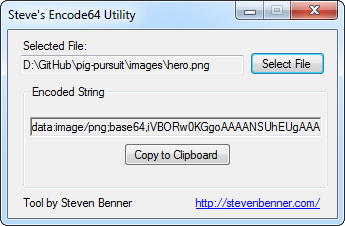 This is my super-simple Encode64 tool for Microsoft Windows. It's used for creating data URIs. Click the Select File button to open the file you want to convert or drag and drop the file on the window. The tool will show the encoded string. Then click the Copy to Clipboard button. Paste the string wherever you need it. Built by Steven Benner. Released under the MIT license. Fork this project from the GitHub repository.